US, 1987, 90 minutes, Colour. Danny Aiello, Suzanne Pleshette, Georg Stanford Brown, William Converse, Joe Morton. 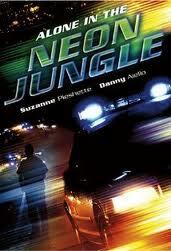 Alone in the Neon Jungle is an interesting telemovie focusing on a police precinct where many of the officers are corrupt. Danny Aiello plays the chief who wants the precinct cleaned up. Suzanne Pleshette is the captain who comes in to do the job. The film has a portrait of crime in the ugly contemporary American city. It also shows police corruption, burglary, fencing burgled goods, murder and vice. The film has the regular cast of characters: the co-operative police, the unco-operative police, the young rookie on the way to being corrupted who changes his testimony, the police officer who has a conscience, the faithful assistant. There is also a touching on the relationship of the captain and her marriage to her husband and his career. While the material is familiar, the topic is very relevant for the '80s, focusing on the need for efficiency and honesty for the combating of crime in the American city. Direction is by Georg Stanford- Brown, who makes a guest appearance. 1. Interesting police drama? Telemovie style? American police and the cities? Universal? 2. The sequences of the city, vice, the police precinct? Musical score? 3. The title and its reference to Captain Hamilton? Her abilities, her work? Her gradually getting support? 4. The setting with the police precinct: the police and the robbery, their arrest? The dismissing of the officer in charge? The interest of the chief of police? The appointment of Captain Hamilton? The hostility of the members of the precinct? 5. Captain Hamilton, her background? Her relationship with her husband, his career, tensions, reconciliation? Her efficiency, her parades and reports? The hostility of the group? Her investigations, the information about the gangster, the raiding of his bar? His arrest? The rounding up of the prostitutes? Her laying down the law to everyone, especially the lieutenant in charge of the vice squad? The gradual leads? The murder of Benson and the investigation? The murder of Wendy? Hansen and his information? The raid on the corrupt police at the camp ground? The cleaning up of the office, the support of her staff, her going to testify on behalf of Hansen? The image of the police? Of the policewoman? Her efficiency, on a par with men? Her approachability and concern? 6. The presentation of the police, the desk assistant, his staying with the sinking ship, processing the resignations slowly? His assisting her at the raid on the bar? Final support? Jackson and the vice squad, explaining the city to the captain? The raids? Wilson and his being at the bar, hostility, her laying down the law, his pepping things up, the arrest of the prostitutes? Hansen and his being new, his corrupt partner, going to the camp ground, falling in love with Karen? His decision to go to the captain? Her support of him in the trial? 7. The corrupt police: burglars, fencing goods, the prostitutes, the camp ground, protection? 8. The gangster, his bar, the murders? Corruption, the death of the prostitutes? 9. The efficient black officer, his friendship with the captain, his investigations and reports? The irony that he was Benson's partner? Final revelation that he was a killer? 10. Glimpses of characters, the pressures of police work, the temptations of corruption? The need for authority and efficiency? Honesty?